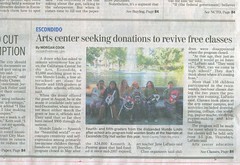 I was interviewed yesterday for this article in the North County Times newspaper. You can read the whole article here. And make a donation by mailing it to: California Center to for the Arts, Escondido and sent to the Education Department, Mundo Lindo, California Center for the Arts, Escondido, 340 N. Escondido Blvd., Escondido, CA 92025. Such a worthwhile project. The kind of think I want to believe will keep our kids drug free in the future. I know it's a stretch, but "this I believe"
hey jane!!! its monica espinoza...your juvenile comedic volunteer. contact me at (760)703-4250 if its possible that i can still volunteer. thanks!